In terms of candy, is Easter the new Halloween? This may be arguable, but there's no doubt that messing with Easter Candy--especially Peeps and Cadbury Creme Eggs, it seems--is au courant. 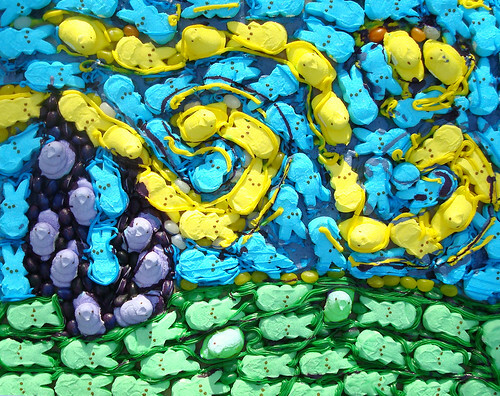 We, of course, are not immune to the lure of this trend: case in point, a CakeSpy fine art take on it can be seen above in our master-peeps recreation of Starry Night. We love it, but we don't actually want to eat it: We love Easter candy. We love the bright, sometimes garish, pastel colors; we love the cartoonlike egg, chick and rabbit imagery. We love the idea of it all--but we don't necessarily want to eat it. Because the fact is, sadly, that most Easter candy is not actually delicious. 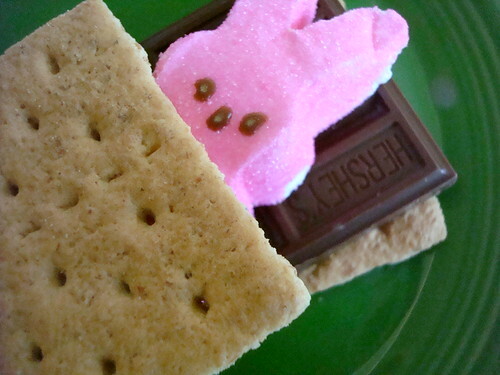 So perhaps the movement in food installations and art involving easter candy is just another way to celebrate it. All we can say is, Andy Warhol would have loved it. We're deeply cruel: We're a nation of misguided youth. Growing up with violent video games and movies, our senses have been dulled and we've become callous and violent ourselves. Guns don't kill people, people kill people. And apparently, people also kill peeps. We've never grown up: As children, we were admonished to "not play with our food". But now that we're grown up (sort of), we can mess with it all we want! We don't have to eat our food, we can draw faces on it, destroy it, make art with it--and the internet is all over it. Booyea! 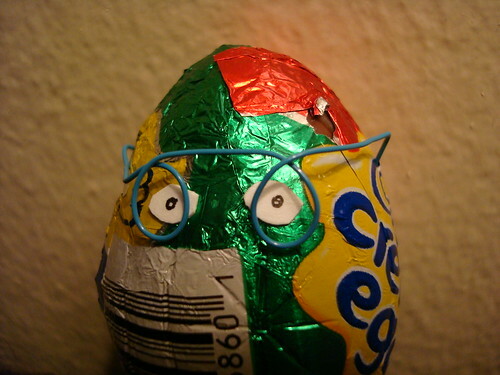 It's totally fun and awesome to mess with Easter candy. This is a statement, not a theory. No follow up questions. Unlikely Words has compiled a comprehensive and fascinating study on Marshmallow Peeps and their place in culture. Read it now! Here today, Goo Tomorrow: Even Cadbury is in on the action, hosting contests and providing bulletin boards for users to enter Creme Egg murders and discuss the lure of the most incredible edible egg. If baking with Easter candy is your bag (or basket, as it were), be sure to check out Baking Bites (there is a side bar with easter ideas on the right hand side of the site) for plenty of creative and delicious-sounding recipes. Last year, we messed with Easter candy in a variety of fun ways: check out our ideas for how to use your leftover easter candy, and our interview with a Cadbury Creme Egg.